I discovered some free radio memory management software this morning. Called CHIRP, which is presumably an acronym that ends with "Radio Programming", it is a free, cross-platform, cross-radio programming tool that is being developed by Dan Smith, KK7DS. CHIRP works on Windows and Linux (and MacOSX with a little work, according to Dan). 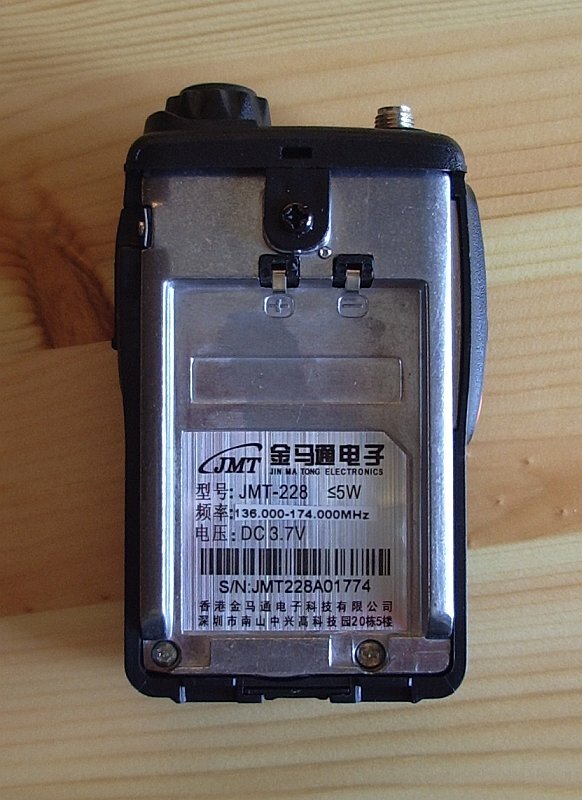 It supports a whole list of radios from manufacturers such as Alinco, Icom, Kenwood, Yaesu and Wouxun. As the VX-8R is listed, I thought I'd give it a try with my VX-8GR. Unlike the excellent but non-free FTBVX8 software from G4HFQ, CHIRP doesn't prompt you with the steps you need to perform on the radio. If you just connect the radio, load the software and start the download nothing will happen. With the VX-8R you must begin with the radio turned off, then after starting the download press and hold the F/W button on the side while turning the radio on. When CLONE appears on the display, press BAND. The download will then start and the program will display its progress. With other radios different steps will no doubt be needed. Hopefully at some point prompts will be incorporated into the software. My first download attempt did not complete. Instead an error message appeared near the end. But I tried again. This time the memories were downloaded successfully and displayed in the program as you can see. The "cross-radio" part of the specification means, presumably, that memories are saved in a unified format so you can download them from one radio and upload them to a different one. I didn't try uploading to the radio. I have heard of people bricking radios by using software that wrote unexpected stuff and I'd already seen one error message. Besides, I have the FTBVX8 software and I didn't have any changes I wanted to make anyway. But if you don't want to pay for memory management software, you want to maintain one memory file and upload it to multiple different radios or you want a program that will run on Linux or Mac OS, CHIRP is a development that's worth keeping an eye on. Details are yet to emerge about the nature of the misconduct that led to the dismissal of the RSGB's General Manager Peter Kirby. However in one or two blogs and forums it is already being suggested that this should be an opportunity for root and branch change at the RSGB, a chance to get rid of the "old school tie brigade." I don't agree. I may be an old fart now, but when I first joined the RSGB back in 1973 I was 20 years old and it was an even more traditional organization than than it is today. Most of the officers held two-letter calls that indicated they had been licensed since before the war. Radio Communication (it was years until it became the more trendy RadCom) had more of the air of a professional electronics journal. But did I feel that the RSGB was an old boys' club that should be run by more know-nothing-but-think-they-know-it-all youngsters like me? Did I write letters asking for Radio Communication to be dumbed down to make it more understandable to newcomers? No I didn't. The RSGB did have a bit of an air of being an elite group, but I was proud that it now included me. And instead of grumbling that the contents of Radio Communication were over my head I aspired to understand what was then a mystery. Unlike other radio services ham radio is a hobby with a long tradition and that is one of the things that is reflected by the RSGB. I never attended an RSGB annual general meeting. But when these were held they were usually followed by a "black tie" dinner. I've seen Big Issue sellers more smartly attired than the average radio rally attendee and I have often wondered if these formal dinners were part of the same hobby. But the fact that I had no desire to attend such functions did not mean I felt they should not occur, or that the people who attended them could not possibly represent the interests of people like me. I think the RSGB has done quite a good job so far, especially considering the differing and often conflicting demands of its members. Britain was one of the first countries to drop the Morse proficiency requirement and to introduce a licensing scheme that made it easy for the very young and those with limited technical knowledge to enter the hobby. These are hardly the actions of an RSGB dedicated to maintaining the status quo, to resisting change, to keeping ham radio an elite club of people who know code and understand circuit diagrams. I don't think the misdemeanours of one salaried officer should be allowed to overshadow that achievement. One bad apple doesn't mean you must cut down the entire tree. We live in an egalitarian age where everyone's opinion counts and it seems that many want an RSGB run by people like them. I just wonder where that would lead. If you look at history, the times when Britain was great was when it was run by leaders who were in their 60s and 70s. Now the country is run by political careerists in their 40s and 50s and look at the mess we're in. We need an RSGB that can shape the future of the hobby but still respect the the past. One of the problems with operating in the evening is that on most HF bands even a few watts of RF is enough to turn on the neighbours' security lights. So there is an extra incentive to work QRP. This evening I tried JT65A at 2W on 30m, then moved to 20m with 5W. This map shows where my QRP signals were received. The antenna on 20m was the multiband attic dipole. Stations worked included K3AXR (FM28), KF4NX (EM83), AB0DI (EN41), VA3WLD (FN03) and KD2A (FN13). By the way, whoever said JT65A is not a chat mode! Peter Kirby, RSGB General Manager, has left the Society’s employment after the discovery of financial irregularities on his part. For the time being, RSGB Director Don Beattie, G3BJ, will act as General Manager. At this difficult time for the Society can I ask that everyone supports Don in his role. He may be contacted at Don.Beattie at rsgb.org.uk or 01234 832 701/07802 922 219. Further comment from me would be inappropriate until we know the nature of the financial irregularities. But to say the news comes as a shock would be an understatement. I have been an RSGB member for nearly 40 years, barring a few years in the 1990s when I was inactive in the hobby. The Society will never please everybody and it has done a few things I don't agree with but I think all things considered it does a pretty good job. I hope it will survive this crisis. Alfred Wainwright said that he could not understand why anyone would want to walk round a Lakeland fell when they could walk over it. He never met my wife. Olga has always been a reluctant companion on my summit walks - except a few very easy ones. In fact, the scenery in this part of the world is spectacular even from the roadside, so it certainly isn't necessary to climb summits to have a nice walk. Of course, you can't activate any Wainwrights for WOTA unless you are on the top. But you can still work other people who are on the summits and claim the points for your chaser score. Olga has finally agreed to my doing summit walks by myself. But we still want to do walks together so some of the time I will go for low level walks. This afternoon there was an excuse for such a walk. 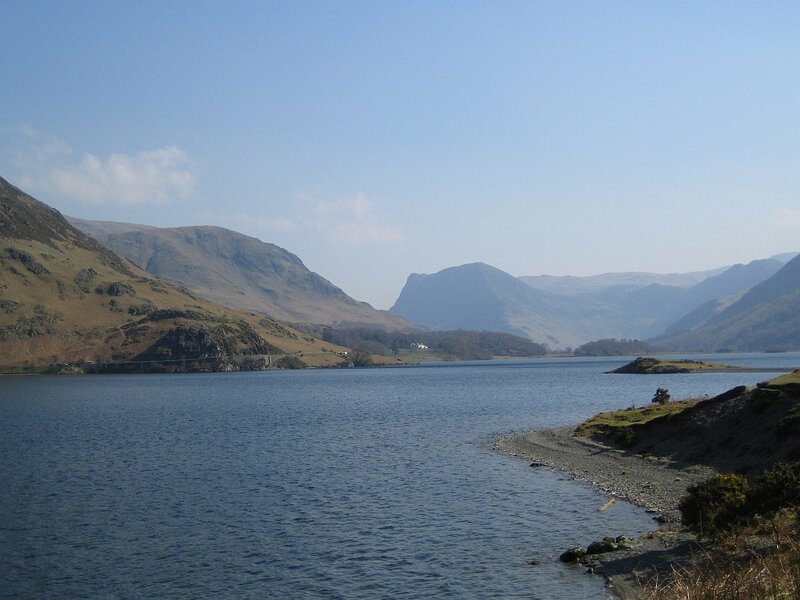 Phil, G4OBK had posted that he would be activating Rannerdale Knotts, one of the lowest Wainwrights and one that is hemmed in by higher hills so that it is probably not workable from home. 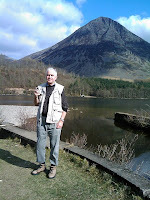 So we decided to go for a walk beside Crummock Water from where Rannerdale Knotts would be in line of sight. 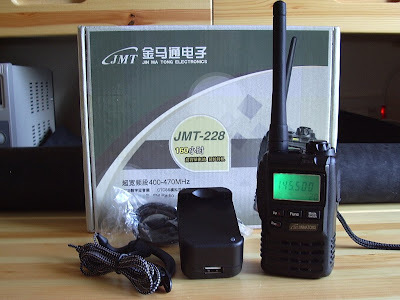 As I would be out of range of any APRS digis or gateways I decided to leave the fancy APRS radios behind and take the little Jin Ma Tong JMT-228, a Chinese VHF radio I bought on eBay. As it has mainly been used to monitor my Echolink node the antenna was just a 2 inch long stubby duck. I thought that should be able to make the half a mile path across the lake. I intended to take a better antenna "just in case" but I forgot. We arrived at the National Trust car park at Scalehill Bridge and I had just got out of the car and switched on the radio when I heard Phil calling CQ WOTA from Whiteless Pike, LDW-106. I stood the radio on the roof of the car while I put on my boots and waited for my turn to work Phil. The audio from the tiny radio was surprisingly load and turned a few heads! Finally I got my report, 5 by 9, and we set off on our walk round the lake. It was a pleasant walk in the warm sunshine with skylarks singing overhead. I heard Phil working Derek 2E0MIX/P and telling him he would be on the summit of Rannerdale in about 15 minutes. We found a sunny spot looking across to the bumpy ridge and waited. Eventually a couple of figures appeared silhouetted against the skyline - Phil and his walking companion Geoff - followed shortly by CQ WOTA on the radio. I called Phil for the inevitable 5 by 9 report and that was that. Rannerdale Knotts, LDW-209, was on the list. We retraced our steps, not wanting to be out too late as Olga had dinner to cook. Half way back to the car I heard another CQ WOTA, this time from Derek 2E0MIX/P who was on the summit of Grasmoor, LDW-020. I stopped and made contact and had a quick chat with Derek while Olga took the picture on the right using my phone. Phil had said he was going to activate Whiteside, LDW-084 if he had the time, which he did. I was back home by the time he reached it. I was listening on the JMT-228 and stubby duck antenna from inside the house and Phil's signal was 5 by 9. (The JMT has quite a decent S meter by the way, it isn't all or nothing like many handheld rigs.) Phil didn't hear me until there was no-one else calling him but when he did he gave me a 5 and 5 report. Not bad for 3 watts into what many people would consider a dummy load, over a distance of 10km. Phil did comment that the audio from the JMT-228 was a bit low compared with my other radios. I don't think that's surprising as the radio is probably set up for 12.5kHz or even 10kHz channel spacing, and the level is not adjustable as far as I know. Still, I'm happy with this little radio and I think it acquitted itself very well on its first outing. Yesterday I was out hiking round the back of Skiddaw in Wainwright's Northern Fells to activate Great Sca Fell (LDW-114) and Brae Fell (LDW-134). 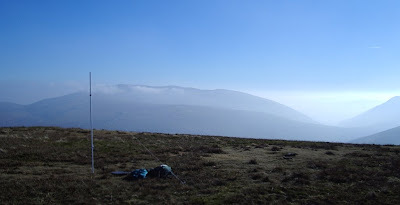 One reason for being out and about in that area was that Phil G4OBK was planning to activate Great Calva (LDW-095) which is one of the three summits I need to complete the Northern Fells as a chaser. I'd have been less keen if the weather had been miserable, but Thursday was a glorious day, sunny but not too hot and without the breeze that can often make it icy cold on the tops even when it is warm in the valleys. It is a long, steady plod up from Longlands and I reached the summit of Great Sca Fell around 12:30. I put up the WOTA Pole and then sat down to eat my lunch. To raise the height of the antenna I used my walking pole for the bottom section. This didn't give me as much extra height as I'd hoped as the inner sections of the telescopic pole slid up inside the PVC tubing so I had to collapse it and just use the thickest, topmost section. I connected the VX-8GR to the antenna to beacon my position on APRS while I ate the lunch Olga had made me. I tuned around whilst I was eating and heard a couple of distant stations. I observed their signals being desensitized intermittently. Clearly the VX-8GR receiver is not up to being connected to a good antenna in a good location. After lunch I connected the Motorola GP300 - which has a much more robust receiver - to the antenna and began calling CQ WOTA. I worked 11 stations in all from Great Sca Fell, but they were all from the northen area as signals to the south were blocked by the great bulk of Skiddaw and Blencathra. I waited for Phil G4OBK to arrive on his first summit of the day, Bakestall, so we could have a summit-to-summit contact. I then called upon Mark MM1MPB and Colin 2E0XSD to help with my second objective of the day, which was to do some tests to see how much difference the WOTA Pole made to my signal compared to other antennas. First I compared the signal between the WOTA Pole (which is a Slim Jim made of 300 ohm ribbon cable inside some PVC electrical conduit) and the 5/8 wave telescopic Black Whip antenna from jeepbangkok on eBay. I'd been pretty impressed with the 5/8 telescopic on previous activations but the reports from Mark and Colin suggested that the WOTA Pole was a couple of S-points better. Unfortunately while extending the telescopic antenna to make the test I broke it! That's the end of that, which is a pity because I'm sure there will be circumstances - such as on busy summits or rocky ones where there is no earth to drive the guy pegs in - where the telescopic would still be useful. For an additional test I tried an 8 inch long single band helical "rubber duck" which I'd previously established to be comparable to a quarter wave whip and a noticeable improvement over the stock dual band antenna that comes with Japanese handhelds. 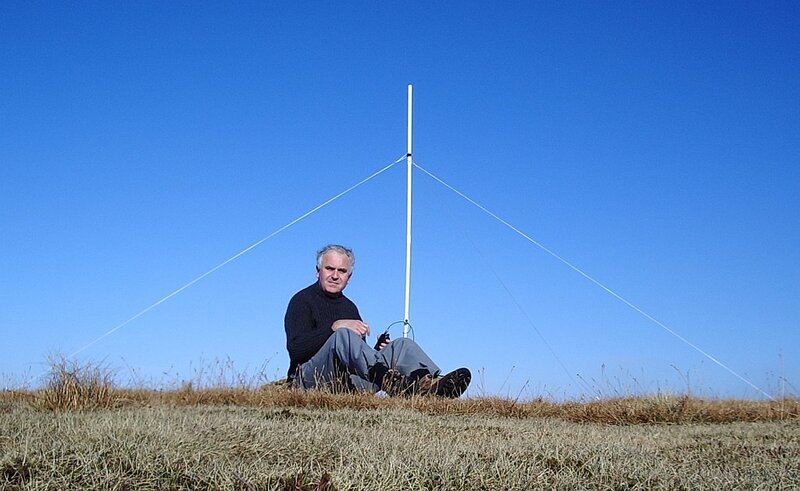 Colin couldn't hear me on the helical at all, while Mark's verdict on my signal was "awful." So the WOTA Pole is very definitely worth the trouble of erecting it and enables me to give points to stations that would not otherwise be able to hear me. I packed everything up and made my way over to Brae Fell which was half way back to the car by another route. I set up the antenna and finished the rest of my coffee. A lone skylark, perhaps the first of the year, circled calling overhead. I began calling on the radio. Again there were plenty of takers. I worked 12 stations in all including another summit to summit with G4OBK/P on Great Calva. So a successful day out (apart from breaking an antenna.) I just need to work someone on Mungrisdale Common and Souther Fell to complete the Northern Fells. They have been activated before: unfortunately they are not workable from home due to being of only moderate height and on the other side of Skiddaw. As they are probably the two most boring hills in the entire Lake District they are not often visited so I may have a bit of a wait until I can claim my Wainwrights On The Air Northern Fells chaser certificate. Following my rant about Internet Explorer 9 this morning I noticed that Firefox 4 had now been released so I decided to update my 3.6 version. The update took less than half the time, there was no disabling of security software or restart required, it checked my add-ons for compatibility and automatically updated those as well. And all the pages I have tried to view display perfectly. A flawless, hassle-free update, just as it should be. Remind me again why Microsoft is so successful? Bob Bruninga, WB4APR, has updated the APRS specifications to allow amateur radiation monitoring stations to report readings over APRS. A new APRS symbol for a radiation monitor has been defined using the characters RH. Although this is an H symbol with an R overlay, Bob suggests that there is no reason why APRS clients cannot give this symbol a distinctive icon. A new weather field X has been defined for reporting nuclear radiation levels. The format is Xxxx where the first two digits are the precision and the last is the order of magnitude in nanosieverts. So 123 is 12 * 10^3 nanosieverts or 12 microsieverts. There are already websites that report radiation levels using proprietary software, for example Radiation Network (which only covers the USA.) But the ability to report this information using the APRS network using the infrastructure that has already been developed for reporting weather observations is an exciting development that will no doubt lead to some interesting constructional projects. I had seen rumblings in various forums that the new Internet Explorer 9 caused problems for some websites so I thought that I had better install it for myself in order to check mine. The installation process itself was alarming. A window came up to say that various programs that included system functions were in use and had to be closed. I agreed, while making a mental promise to myself that if this f***s up my computer then I'm switching to Linux for good! I also saw my security software disabling itself. If any other program from any other source did that I would bail out quick. It really is sheer arrogance on the part of Microsoft to expect users to allow an installer to do things that security common sense says it shouldn't, just because the software came from Microsoft. I wonder how long it will be before the malware guys set up fake IE9 downloads which exploit the knowledge that the setup disables security to load bad stuff on a computer? After the install was finished the computer had to be restarted. Windows just loves being restarted. I wonder how many millions of hours of productivity are lost every year waiting for Windows to restart after an update? But I was now ready to try Internet Explorer 9. The first thing I spotted is that the embedded APRS maps from aprs.fi on my website and also the WOTA website no longer work. Instead of the expected map you get a message box that says: "Minimum usable map size is 200x100. Currently: 550x0." This is something that has worked on every single browser on every computer platform until now. It is another example of Microsoft arrogance to release a browser that is incompatible with everything that went before, knowing that because so many people use their lousy browser website developers will have to change their sites to make them work with Internet Explorer. On my QTH Information page where I had an embedded map from Google Maps showing an aerial view of the neighbourhood centered on my house, the map is replaced by a # and a pop-up panel appears at the foot of the page to say "Internet Explorer has modified this page to help prevent cross-site scripting." I have no idea what that's all about. I guess I'll just have to dump the maps. I gave up writing software except for my own use because Microsoft made it impossible for self-taught amateurs like myself to write programs that work on all the different versions of Windows. Now it seems they are trying to make it impossible for self-taught amateurs to create web pages. Why can't they keep things simple, and if something worked why did they have to break it? Perhaps it's time to reinvent those little badges that people used to put on websites in the 1990s, only this time the badge would say: "This website works best in anything other than Microsoft Internet Explorer." JT65A is a wonderful mode, and JT65-HF by Joe Large W6CQZ is a wonderful program that makes it enormous fun to operate. True, the mode only allows the exchange of signal reports, though a very brief amount of extra information (such as power and antenna) can be sent in a custom message. But so many contacts using other modes also only result in the exchange of such limited information. On the other hand, there is a certain magic in seeing faint musical tones sent by a faraway station translated into a message on your screen. Many people have said that JT65A is addictive. I agree. If there is one problem with the mode, it is that the 50 second transmit cycles where nothing is decoded on to the screen until the end makes it easy for your attention to wander. I'm ashamed to admit it, but many is the time someone has replied to my calls and I missed it because my mind was elsewhere. So I was really pleased to discover an add-on for JT65-HF written by Laurie VK3AMA called JT-Alert. One of a pair of add-ons he has written (the other is a kind of macro tool for custom messages) it watches the decoded text and sounds an audible alert when a CQ call is received or when a station replies to your call. You can have different sounds for the two alerts, and the audible alert is optional and can be disabled. The tool can dock to the bottom of the JT65-HF window (as in the screenshot above) so the two function as one program. It was a fine afternoon and I needed some exercise so I took the VX-8GR and the Albrecht 10/12m handheld and went for a stroll over Watch Hill. 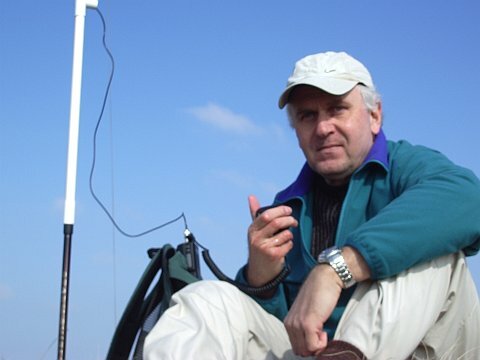 I put out a call on the 2m FM calling frequency and was answered by Jim, G3XPD, a few miles away. I asked if he could QSY to 28.500MHz SSB and he said he could, so I was able to make my first contact with the new radio. When I first heard Jim call on 10m his audio was clear but very weak. This was puzzling when he told me he was hearing me quite well and was running 100W to my 4W. Eventually I realized this was due to the RF gain setting of the Albrecht. It is accessed via a few button presses, effectively on a menu, so I had left it as it was set by default. This clearly made the gain very low. After winding it up to maximum (see, I'm turning into a CBer!) Jim's modulation was rattling the loudspeaker. No shortage of gain there, for sure. The receive audio was very clear. Jim commented on some wind noise on my transmissions, which I was able to tame by changing position so the internal microphone was shielded by my head. I didn't ask if he could hear any FM on my SSB modulation and he didn't mention it. That's good, as it suggests the problem isn't noticeable enough to prevent making contacts and there is no urgency to try the modification that is supposed to cure it. The main problem would seem to be tuning the radio on SSB. The Albrecht AE2990AFS is basically a CB radio designed to work on fixed 10kHz channels, even though it does have dedicated ham band modes. The tuning steps of the radio are 10kHz just like a CB radio. You can press a couple of buttons and select 500Hz steps but you can't tune the band this way. You can tune in 500Hz increments up to just before the next 10kHz multiple then the VFO rolls back to where you started. There is a clarifier or RIT control which is designed to tune in stations that are slightly off the 10kHz channel. It's range is something like +/- 5kHz so it is quite touchy. There is no centre detent to mark the off position. What this all means is it's quite hard to tune the band looking for signals and if you do tune someone in the chances are you'll call them off-frequency. A better solution, in my opinion, would be to dispense with RIT and make the clarifier change both the transmit and receive frequency. But if it was possible to do that one wonders why the manufacturer didn't. I imagine that the control works by pulling an oscillator using a varicap diode so there is a risk of making the FM problem worse under the varying load conditions of SSB transmission. But if it could be done without affecting the transmitter frequency stability that would be a mod worth doing. In the wake of the Japanese nuclear disaster there has been a surge of interest in interfacing Geiger counters to home weather stations so that radiation levels could be monitored via APRS. When you think about it, it seems a very good idea. Even if the measurements were not of lab grade accuracy, they would be good enough to show what was going on. It could avoid unnecessary panic - and equally make it impossible for officials to hide the existence of a radiation leak - if data from a network of amateur radiation monitoring stations worldwide was publicly available. This could be a real application to make APRS relevant even to the general public. A standard for representing radiation measurements in APRS weather packets is being worked out as I write. The question is how to interface a radiation monitor to an APRS system and what hardware is needed to measure the radiation? Unfortunately, if not surprisingly, the final bid price of dosimeters on eBay has gone through the roof in the last couple of days. But in any case they all seem to be standalone instruments with no computer interface. I don't know if a homebrew device would be possible, given that calibration would be needed, but if someone could develop one I think it would be a popular project. Like anyone with an ounce of compassion, Olga and I have been concerned about the welfare of the people of Japan. But it is becoming clear, at least to me, that most of the anxiety we initially felt about a nuclear catastrophe occurring in the country has been caused entirely by irresponsible and sensationalist reporting by the western mass media. Scrolling news headlines screamed about fear of meltdown even while nuclear experts on the same channels were explaining how, due to the design of the reactors, this wasn't likely. Fear has been generated over increased radiation levels in Tokyo causing many expatriates to flee home, many on the advice of their own western governments. But whilst reporting these increased levels, the news media have not bothered to put them into context, such as how the amount of radiation compares with that received on the flight home to London or on a holiday in Cornwall in the south west of England, a place where the naturally occurring level of radiation is so high that nuclear plants cannot be built there because they would exceed the legal radiation limits before they even started. Yesterday, apparently, the Italian relief agency did a test for radiation on the roof of the Italian embassy in Tokyo and got a reading which is lower than the usual reading in Rome! The problems with the Fukushima reactors are almost a non-event compared to the tsunami which has displaced half a million people and wiped whole towns off the map. If the rest of the world wants to help Japan it should get a grip and focus on the real disaster. In my search to try to find out what is really going on I have found a couple of blogs which I have added to my blogroll. The first is A Brasspounder's Cafe by Leo, JJ8KGZ. He has just begun to write about his experiences during the earthquake last Friday. The second, The Intercultural, is written by a British academic working in Tokyo. The author is not a ham at all, but the blog is very well written. Finally I have added the blog of Atsu, JE1TRV which is called CW4EVER. He hasn't written much about the disaster and his interests are a bit different than mine but my blog was already in his blogroll which is good enough for me to add his to mine! Meanwhile we continue to think of the people of northern Japan, and especially the 50 heroes struggling to regain control of the power plants at Fukushima, and hope that things start to get better for the Japanese people very soon. Several people seem to have found what I have written about the Albrecht AE2900AFS a.k.a. Dragon SS-301 and various other names useful. Now here's a chance for owners of those radios to help me. The radio came without a charger. I haven't even seen one advertised for sale. No problem - I can make one. But I have no idea what the charging voltage should be. The manual is no help whatever. If you apply 12V or even 13.8V DC no current is taken - hardly surprising as that is not a high enough voltage to charge nine NiMH cells which probably have some reverse polarity protection in series with them. Is the charger a regulated or unregulated wall-wart and what is the voltage and current rating? Since writing about the Albrecht AE2990AFS 10m multimode handheld, where I wrote: "There is an annoying beep at every button press, but this can easily be silenced" I have received several emails asking "How?" The answer is in the manual, on page 25, under "Other Functions: Beep Tone and Roger Beep" which is how I found out how to do it. To save any further questions, here's how I did it. Press and hold the SCAN/M-SCN button for three seconds, then press it again. The display will show BP ON. Press the DOWN button and it will change to BP OF which is obviously short for BEEP OFF. There is a musical note icon on the LCD that appears when the beep tone is on. The roger beep is activated / disabled in the same way if you press SCAN/M-SCN twice after the initial long press. There is another icon of two musical notes to show when that is on. Easy, isn't it? Actually there's no need to hold SCAN/M-SCN for as long as three seconds, only until the display changes to SH. This doesn't seem to be mentioned in the manual at all but it is clearly where you set the amount of shift used when the "+" and "-" shift functions are invoked to work through a repeater (repeater shift is enabled by pressing FUNC followed by STEP/CH.FR, but it only works in the ham band modes.) On mine, the shift was set to 600kHz so you need to dial it down to 100 for 10m repeater use. It's a pity the radio doesn't support selectable CTCSS repeater access tones since most 10m repeaters in Europe use something other than the provided 88.5Hz access tone. I suppose it is possible that this function is not available in similar radios to the Albrecht sold under other names. It appears to be the case that other radios don't possess the ability to switch between 10m and 12m by pressing the CH 9/19 button. This is my latest eBay acquisition: a Dymo LabelManager 210D. Clearly there is not a big demand for these things on eBay - I got it for £5.50, though the postage was nearly as much again. So the total cost was less than a third what it would have been to buy a new one. That is about what it is worth to me as I only wanted it to make front panel labels for my home-brew projects. The labelmaker was used and didn't come with a manual or power supply but that wasn't a problem. Google quickly located a PDF manual to print out and I have plenty of power sources in the shack. The one thing I will have to watch is that although the DC input uses a standard barrel type connector the centre pin is negative which is the opposite of everything else that uses that type of connector. So I will have to remember to check the polarity before plugging it in. The label tape that came with the machine produces black text on white. But you can buy cassettes of tape in different colours. This particular model accepts cassettes that include a choice of white on transparent, which will look better on painted front panels. 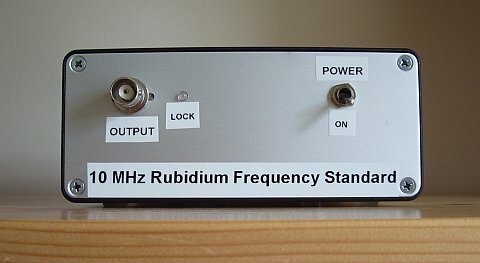 Black on transparent would look better on bare metal than these labels which I made for the front panel of my 10MHz rubidium frequency standard but they still look better than the old embossed Dymo labels we used to use in the 70s. (I also have none too fond memories of trying to label front panels using Letraset.) Life is much easier for those constructors who don't care what their projects look like but I always like to try to make them look professional even if the construction itself is definitely amateur! I'm taking a bit of a break from radio. Perhaps it's because I'm feeling a bit run down or perhaps I'm suffering from radio burnout but at the moment I can't even be bothered to turn on APRS or WSPR or something that will run even when I'm not there. I think the events unfolding in Japan may have an influence on my feelings too. We are used to seeing disasters on our TV screens but the scale of this one seems to eclipse anything in living memory. Hobby activity seems frivolous when you consider how the inhabitants of north eastern Japan must be feeling. The floods that hit my own home town seemed devastating at the time and after more than a year many people are still not back in their homes. But by comparison with what has happened in Japan, what happened to us pales into insignificance. It will take many years before life returns to normal for many people there - if it ever can for the tens of thousands who will have lost family members and loved ones in the disaster. My heart goes out to them. It is yet another reminder that the works of man are as nothing compared to the forces of nature. If the earthquake and tsunami were not bad enough there is also the impending threat of a nuclear disaster. One is eerily reminded of the Chernobyl disaster, the 25th anniversary of which is only just over a month away. Though the nuclear power experts assure us that everything is under control and there is no risk of another Chernobyl, the headlines scrolling across the screen still scream "Meltdown." This is a disaster that is going to have repercussions across the world, and I'm not talking about the economic shockwaves from such a big blow to the world's third largest economy though I'm sure we will soon feel them. The Three Mile Island nuclear incident in 1979 halted the development of nuclear power in the USA for thirty years. It is unrealistic to expect that what is happening to the Japanese nuclear plants won't have an impact on how people here feel about nuclear power. Engineers have and will continue to argue that the Japanese plants were 40 years old, that actually they coped with the effects of this major dosaster pretty well, and that the UK is not in an earthquake zone so we would never experience such problems. But for as long as these images are fresh in people's minds, nobody will want a nuclear power station in their back yard. And in a country as small and crowded as the UK if we are going to have nuclear power someone will have to. 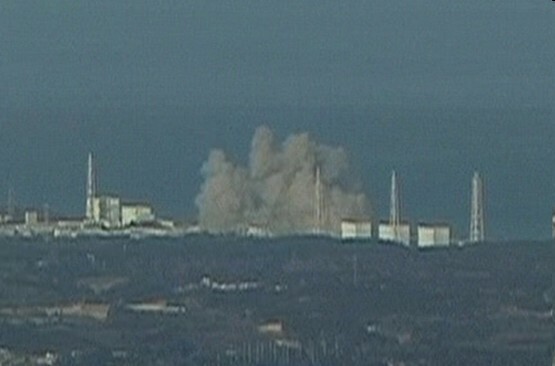 This is a disaster, not just for Japan, but for the entire nuclear industry. Thirty years ago today the Sinclair ZX81 was introduced to the world. The world's first affordable personal computer, it wasn't in fact the first home computer I had owned. That had been a Nascom 1, a Zilog Z80 based machine with just 1Kb of RAM, which I built from a kit - all 1,400 soldered joints of it, using the same Antex soldering iron I still use today. The ZX81 was also offered as a kit as well as a ready built version, so naturally I ordered the kit. I seem to remember it cost £49 - much less than the Nascom. I don't remember how many soldered joints there were, but there were only four main chips. It was a much easier project to build. The ZX81 also came with just 1Kb of RAM. But unlike the Nascom, it had a built-in BASIC interpreter so you could still do more with that 1Kb and you didn't have to program it in assembly code. Innovative design was used to cut the cost of the ZX81. For example, instead of a dedicated display processor the Z80 CPU generated the display. Whenever your program executed, the screen went blank. The screen was an ordinary black and white TV. Programs were loaded and saved using a cheap cassette recorder. That was read and written by the CPU too, which generated wild patterns on the screen while it neglected its display duties. The keyboard was a plastic membrane type. It was horrible to type on. Later I upgraded the memory to 48Kb using a third party RAM pack (the standard RAM pack sold by Sinclair was only 16Kb.) This, too was built from a kit. Like the Sinclair one, it fixed to the rear of the machine using an edge connector, with no other fixing. Every ZX81 owner is familiar with the term "wobbly RAM pack". One accidental jolt could interrupt the connection and crash the computer losing all your work. Ah, those were the days! As a radio ham, I naturally was interested in writing ham radio software for the ZX81. 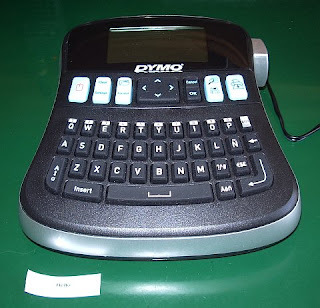 I wrote several programs including a morse tutor, which used a machine code routine for sending the actual code. I think I have written morse tutors for every type of computer I have owned - it's amazing that I am still so bad at reading the code! An article describing the morse tutor and a memory keyer for the ZX81 was published in Short Wave Magazine and was one of my first published articles. I can still remember the excitement of home computing in those early days. Today's PCs, vastly more powerful and capable though they are, just aren't as interesting. Back then, home computing was very much a hobbyist's game. We were pioneers. Now everyone and his granny has a computer, and programming has become more or less a job for professionals. I do miss those old days! Thank you, Clive Sinclair, for bringing us these wonderful toys. Happy 30th birthday, ZX81! 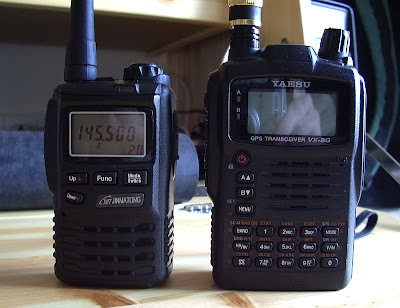 A few weeks ago I did an analysis of the audio levels of different APRS radios and lamented the low level of the audio transmitted by the Yaesu VX-8GR. An Italian ham wrote to me enclosing a copy of a document he obtained from Yaesu showing how to increase the transmit deviation. I decided to give it a try. You can find a copy of this document in the Files section of the VX-8R Yahoo group, but I will describe the process here. Note that performing this adjustment will increase the transmit deviation on speech as well. There is no way to increase the packet deviation independently. Note too that while you are in the alignment menu it is possible to change other settings as well by accident. This may be undesirable, especially if you don't have the test equipment to realign the radio properly, so be careful and perform the adjustment at your own risk! Finally, note that these instructions will work only for the VX-8GR. There are instructions for accessing the alignment menu of the VX-8R on the web. They don't work for the GR and these instructions don't work for the R. I have no idea if any of the instructions work with the DR.
To avoid entering the alignment menu accidentally, Yaesu has made accessing it quite difficult. First you must enable the CW ID (main menu item 16) and program a password AH041M into it. The manual explains how to do this. You must then set the transceiver to single band mode on the A band, in VFO mode (not memory) on a frequency of 430.000MHz. Now switch the radio off. Press and hold the HM/RV key and turn the VX-8GR back on. If all the above steps were carried out correctly the radio should start up in alignment mode showing the first alignment setting. Rotate the control knob clockwise a few clicks to select the MAX DEV adjustment, then press the V/M button to select it. A pointer symbol should appear to show that adjustment is selected. The control knob now adjusts the deviation setting. Make a note of the original value in case you want to reset it, then turn it up to 254. Yes, I know this sounds like a CB "screwdrivers to the max" tweak but as you can see from the spectrograms below, even at that setting the packet deviation won't quite match that of the Kenwood rigs. Press the V/M button again to exit the adjustment, then press HM/RV to exit the alignment menu. The radio will restart in normal operational mode. Don't forget to clear the CW ID once you're happy with the new setting. The spectrograms below show the difference made by the adjustment, with the Kenwood TH-D72 shown as a reference. As you can see, the peak deviation of the high tone is now within 1dB of that of the Kenwood, though the Yaesu still has more low-frequency roll-off. Nevertheless, this is as good as it gets with the Yaesu. If you still can't hit the digis you think you ought to, perhaps you'd be better off with a Kenwood. As I said earlier, this deviation adjustment makes your audio louder as well. You, your local hams or your local repeaters might not like this. The VX-8GR has a "Half Deviation" menu option which will reduce the deviation back to approximately what it was before this adjustment, but it works across the whole radio and not per band, so you can't have the wider deviation only on the APRS band. It is interesting to note that in the Yaesu alignment document the deviation alignment is performed at 435MHz. I found that the deviation on 70cm is higher than it is on 2m. This appears to be a consequence of the way the radio is designed, as there are not independent deviation adjustments for the two bands. But this does explain to an extent why the deviation on 145MHz is lower than it should be. Where I live, 70cm is completely dead and 2m is quiet so we can operate using 25kHz channel standards with no problems. Therefore I have not found this adjustment to cause any adverse effects and it certainly has improved the reach of my APRS packet beacons. Your mileage may vary. Olga and I returned yesterday from a long weekend in Birmingham. 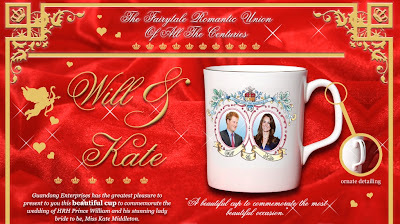 That sounds like one of those joke competition prizes doesn't it? "First prize, a week's holiday in Birmingham, second prize two weeks!" But that would be unfair to Britain's second largest city. It was the first time either of us had visited it and I wasn't sure what to expect, but we liked it a lot. It is clean, modern and prosperous and there are entertainments and amusements to suit all tastes. We went to a ballet at the Hippodrome Theatre, a concert at the Symphony Hall, visited the National Sea Life Centre, the Botanical Gardens, Winterbourne House and Gardens and the art gallery and museum. But on Saturday night the place was heaving with squealing teenage girls wearing clothes so skimpy, despite the near freezing temperatures, that I was concerned for their health. They were there for a concert by someone called Justin Bieber, whom we had never heard of, but who is apparently the current teenage heart-throb. I didn't take a ham radio. I looked at the APRS map for Birmingham and it appeared to be a bit of an RF desert. The only repeater near enough the centre to be accessible using a handheld was D-Star. So I decided to save a bit of weight and space in my suitcase and give the hobby a break. I switched off my mobile when we went into the theatre on Friday evening (to avoid the embarrassment of it ringing during the performance) and didn't switch it on again until Monday when we were preparing to leave. That wasn't a deliberate intention to be incommunicado so much as absent mindedness. I didn't miss it, so it never crossed my mind to switch it back on. Having grown up in a house that didn't have a home phone, and having only been persuaded a few years ago that a mobile would be useful "just for emergencies", it has never concerned me that when I am away from home I am out of touch. But it seems to me that many people can't bear to be disconnected for half an hour, never mind a weekend. On the bus, on the train, walking along the street, even in the theatre during the interval people were staring at the tiny screens held in front of their face. There is a TV advert - I think it's for the iPad - in which, apparently without irony, people are shown clustered round a screen while a fabulous view or famous building goes unnoticed in the background. In the Birmingham Botanical Gardens one woman appeared engrossed in interacting with her Blackberry whenever we saw her, ignoring the plants. Do these people ever switch off? If you are constantly connected, receiving a continual stream of information which you must absorb or respond to, when do you get time to think, to dream, to appreciate the real world around you? Technology was supposed to be our slave, helping us to do things more easily. But it seems to have become a drug. The technology itself is amazing, but for me the most important feature is the ability to switch it off. Yesterday was one of those clear, blue, sunny, still, cold days that make you think it would be a criminal waste to stay inside. 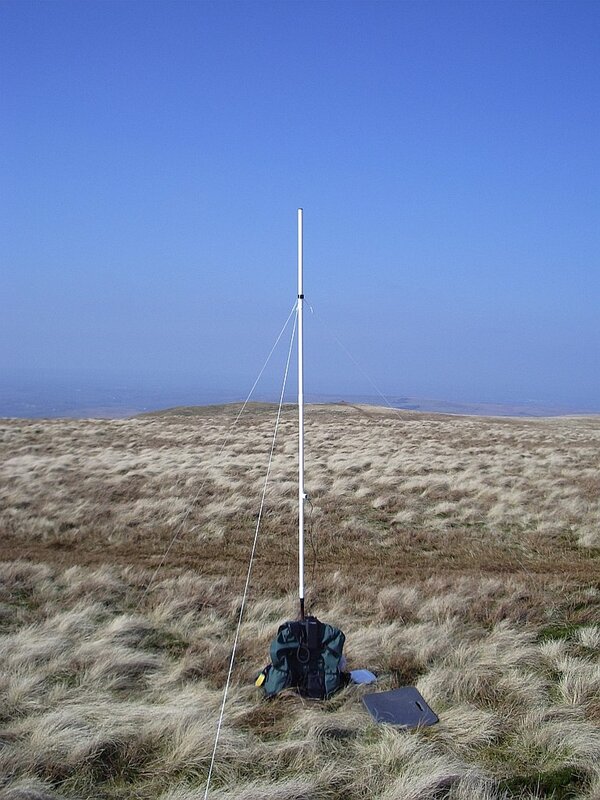 I decided to try another Wainwrights On The Air activation using my WOTA Pole, which had been rebuilt since Sunday's disaster. My intention this time was to visit the summit of Knott, LDW-082, followed by nearby Great Calva, LDW-095. I took the VX-8GR for APRS but this time I also took the Motorola GP-300 to use for the activation which I hoped would avoid the receiver overload problems experienced with the Yaesu. The weather may have been bright, but I was not. Sometimes I seem to get periods of a few days when although physically I may be awake, mentally I am not. Fortunately I hadn't driven far before I realized I had not put walking boots in the car, so a complete disaster was averted. That wasn't the only silly mistake I was to make, though. I parked at the head of Mosedale and started walking up the Cumbria Way path. I approached the structure you can see from the starting point, which turned out to be a large garden shed! The path seemed to be taking me near to High Pike so I thought I would make that my destination and visit Knott on the way back. As I approached the "shed" I heard people making contacts with another hilltopper, Gordon G0EWN/P on Grey Knotts. I took the VX-8GR from the rucksack and made several calls using the helical whip as he completed each contact but he always replied to someone else. After ten minutes of standing around I decided to shoulder the rucksack again and continue climbing while holding the radio. I called several times when Gordon listened for "any more calls" but he was not hearing me. I don't know why that was - another case of a radio front end being overloaded by high signal levels on the fell-top perhaps? I reached a grassy summit topped by a tiny cairn and checked my position and realized that I was further from High Pike than I thought. I also then realized that I didn't have my walking stick! I must have left it by the "shed" when I stopped to try to work Gordon! I turned round and went back. I retrieved my stick, but having wasted half an hour I decided to abandon High Pike and carry on to Knott instead. 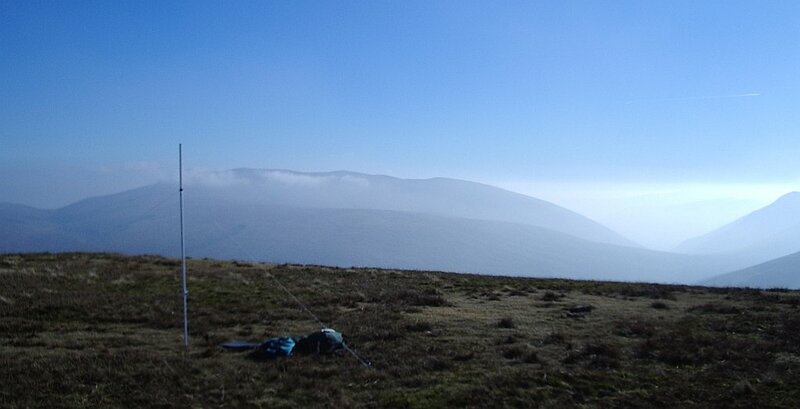 I arrived at Knott still in sunshine with clear blue sky, the distant summits slowly disappearing in the haze. Although it was calm enough to try using the WOTA Pole supported in my rucksack I decided to use the guying kit from the MFD that I'd brought with me in case of windy conditions to avoid the trouble I'd had on Sunday. That cost the antenna some height, but on the plus side it allowed me to operate sitting down which I was glad of as I'd been climbing for over 2 hours by this point. Whilst I ate my lunch I connected the VX-8GR to the WOTA Pole and it was picking up APRS packet bursts from as far afield as Norway and Holland. VHF conditions were obviously up. When I finished my lunch I connected the GP-300 to the antenna. This was when I discovered I'd brought the wrong speaker-mic. One of the hazards of owning too many hand-held rados I suppose! It was not a major problem of course, as I could use the radio without it. 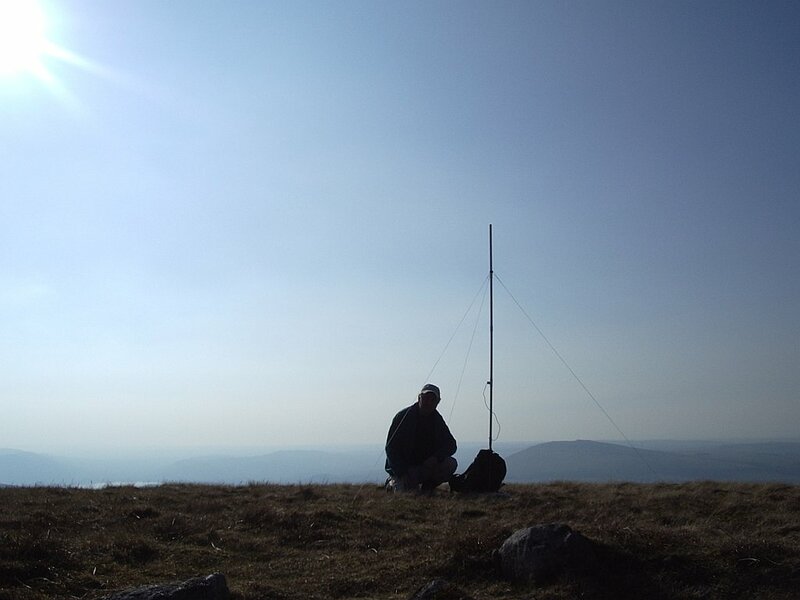 I made several contacts from the summit of Knott the most distant of which was G6ODU in Ormskirk, Lancashire, not a bad haul from the North Lakes. The wind was so calm my Olympus voice recorder logging device was able to make a high fidelity recording of the activation. In case anyone is interested to hear what it sounds like at the sharp end of a WOTA activation here is a recording of about 8 minutes of activity. The loud, punchy audio from the Motorola GP-300 really helps so you can hear both sides of the contact equally well. Some of the quality has been lost compressing it down to an MP3 file of reasonable length but it's still almost like being there! I would have liked to stay on the hill longer to see what else I could work, or even move on to Great Calva to activate that, but a thick bank of mist was approaching and I didn't want to be up there in mist. There are few clear paths on these infrequently walked grassy summits and without any landmarks to aim for it would be easy to get lost. Even though the visibility was clear I still went the wrong way off the fell and hit the Mosedale to Skiddaw House path much closer to Skiddaw House than to Mosedale. That cost me an extra 3km or so of walking to reach the car, by which time the mist had arrived and the sky was a grey murk. This was long walk for only one summit activated. I could have made more if I'd had my wits about me and things had gone according to plan. But on a day like this it's good to be out however many summits you activate!